Buying a telescope can be a serious investment. So taking good care of your telescope is key to a lifetime of stargazing. While telescopes are designed to work outside, it sometimes takes some tender care to keep them working at their best. Over time, telescopes will pick up dust, and depending on how often they are moved from home, their mirrors may need to be realigned, or collimated. Because mirrors and lenses are delicate instruments, however, dust cleaning should take place only every couple of years, Bryan Cogdell of Celestron recommends. Telescopes are not like a pair of eyeglasses, he cautions. "When you see dust on the lens, you might be inclined to clean it, but every time you do that, you might scratch the coating," said Cogdell, Celestron's product manager of astronomy. "That's because when you think about the optics, the surface area of each particle of dust is insignificant." For the actual cleaning, use a camel-hair brush to take away as much of the loose dust as possible. You can also use a compressed-air can, as long as none of the fluid gets onto the lens and smears. Next, take an optical tissue and a lens-cleaning solution — Edmund Optics sells a kit, for example — and carefully clean a small area of the lens at a time. Using the example of a C8 telescope, Cogdell recommends cleaning only an eighth of the corrector at a time and then changing the tissue. This is to minimize the risk of rubbing particles into the glass. Telescope-alignment frequency varies greatly, depending on what kind of telescope you have and how often you transport it in a car. If you commonly go out to areas far away from home on bumpy roads, you may need to realign every time you take out your telescope. There are three main types of telescopes: refractors, which use lenses to bend light; reflectors, which use mirrors; and compound telescopes, such as Schmidt-Cassegrains, which incorporate the use of both mirrors and lenses. Refractors are aligned in the factory and generally do not require alignment, while reflectors require more attention, Cogdell said. Schmidt-Cassegrains sometimes require the secondary mirror to be re-adjusted, but generally only after bumpy rides in the car, he added. 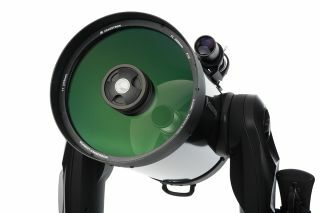 "With a Schmidt-Cassegrain, you can test alignment by de-focusing on a star in the night sky," Cogdell said. "You should see a concentric donut. If it's not concentric, some amount of collimation is required." Dobsonian reflectors, especially larger ones, should be checked every time they are transported to an area away from the house, as these reflectors are the most prone to alignment changes, Cogdell said. "Sometimes, they don't require collimation, but they should be checked every time you take [them] to a dark sky area, anything more than between the house and backyard," he said. The alignment procedure is different for different kinds of telescopes, but details are in the owner's manual that comes with your purchase. Collimation is commonly done with tools such as a laser collimator, or a sort of bull's-eye target. Telescopes should be kept dry to prevent moisture from affecting the quality of your viewing experience. This is particularly a concern with Schmidt-Cassegrains and refractors, which dew up in the front due to condensation. Common ways of keeping telescopes dry include using a dew shield or a shroud (which usually comes with a telescope). Dew heaters are also available, and are especially useful in damp environments such as coastal locations, Cogdell said. If the telescope does get damp, the best approach is to leave it uncapped for several hours and let it dry out. This prevents water from oxidizing delicate areas such as screws, or leaving water streaks on the lenses. If moving the telescope from a warm room to a cold backyard, it's best to let the telescope sit for a while so it reaches a temperature equilibrium with the surroundings. The bigger the mirror on the telescope, the longer it takes to cool down, Cogdell said. While sudden heat changes don't affect the telescope's performance per se, they make it more difficult to see through the instrument due to heat coming off the telescope and distorting the surrounding air.